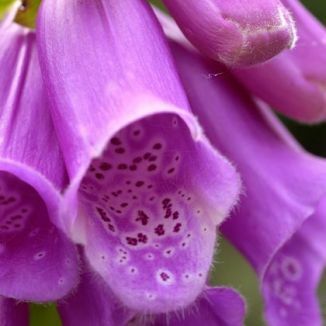 Foxglove is not easily confused with other wild plants on this web site. 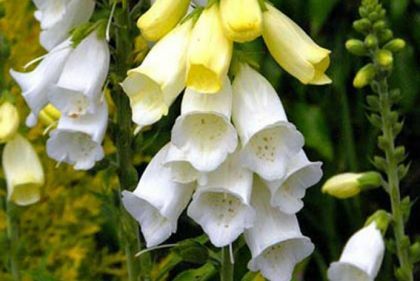 Tall, graceful, downy, biennial plant of woodlands, moors, mountains and sea cliffs, the Foxglove thrives on acid soil and quickly colonises recently cleared ground. Reaching 1.5m, it can have up to 75 blooms on one stem. Its 4-5cm flowers are pinky-purple, even sometimes white, and have two lips with dark spots in the throat. They bloom from June to August. Large oval leaves form a basal rosette in the first year from which the flowering spike emerges in the second. Known to be poisonous, this plant is a native and belongs to the family Plantaginaceae. I first identified this in Glenmalure, Co Wicklow in 1978 and photographed it in 2003 and 2007 also in Glenmalure. Although poisonous, this plant is of enormous use to medicine. It has been found to be a major instrument in the treatment of heart conditions as it contains digitoxin and digoxin. * From the National Folklore Collection, University College Dublin. NFC 1838.92.